Fyr Bal bonfire. Photo by Tad Dukehart. The 54th annual Fyr Bal Festival returns June 16 to the shoreline of Eagle Harbor. Ephraim’s Scandinavian heritage is embraced as the transition of spring into summer is celebrated after the long winter. The day-long event starts off with a yoga class at Anderson Dock, the Ephraim Yacht Club annual pancake breakfast, and a used book and bake sale at the library. The Fur Bal pet parade is back and starts at 9 am. Pets of all types are invited to participate. Pre-registration is not required. The Artisan and Food Vendor Market starts at 10 am and offers various goods and tasty treats. Children’s activities include a visit from Princesses, face painting, t-shirt tie-dyeing, and children’s entertainer, Randy Peterson. The cakewalk returns this year. New this year is the the Fyr Bal Bean Bag tournament. Teams can sign up at the Ephraim Visitor Information Center, Pine Grove Resort, or Wilson’s Restaurant and Ice Cream Parlor until 1 pm on the day of the event. Other activities throughout the day include live music performances, shoe carving demonstrations, a golf tournament, and a raffle. 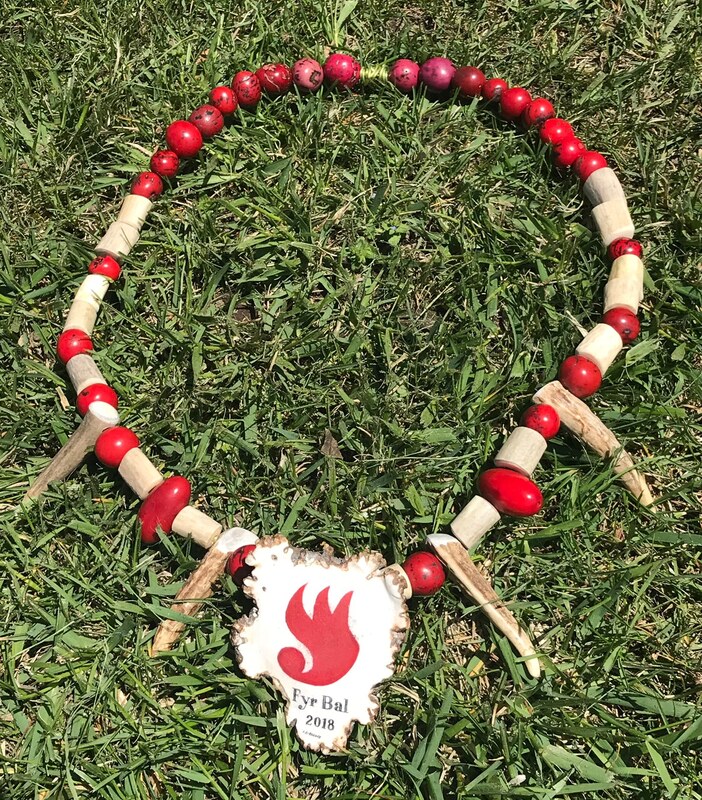 The highlight of the festival is the Chieftain ceremony, where an Ephraim resident or business owner is bestowed with this title which is voted on by the public for service to the community. Scandinavian dancers start the ceremony and the newly elected Chieftain is brought in by boat, guarded by young Vikings. The Chieftain uses their torch to light the first bonfire on the shoreline of Eagle Harbor to ward off the Winter Witch. A fireworks display over Eagle Harbor brings the festival to a close. 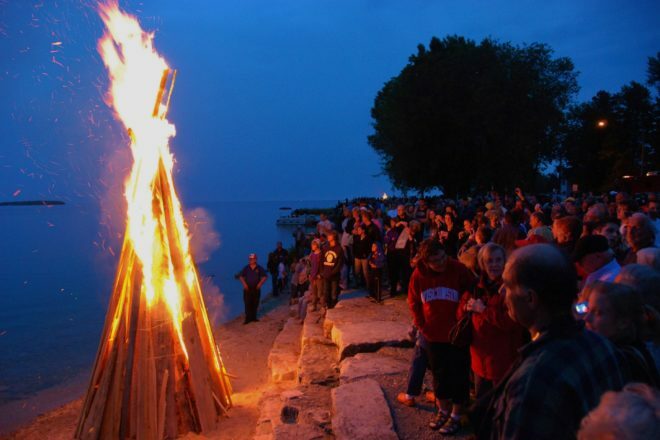 For more information and a complete list of events visit ephraim-doorcounty.com. Chieftain medallion created by Door County Scrimshanders.